VANCOUVER, BC, November 20, 2018 — Mirasol Resources Ltd. (TSXV: MRZ), (OTCPK: MRZLF) (the “Company” or “Mirasol”) is pleased to update the Company’s shareholders on exploration activities in progress and scheduled at the company’s projects in Chile and Argentina for the coming exploration season. Altazor: Newcrest Mining has C$4.3 million budgeted for an extensive surface exploration program starting late in the fourth quarter of 2018 and Phase I drilling program anticipated for second quarter of 2019, contingent on completion of the permitting process. Indra: Hochschild Mining has a commitment of C$1.0 million over the first 18 months of the agreement, with a budget of approximately C$370,000 to December 2018 for surface exploration and target definition for a planned 2019 drill program. Claudia and Curva JVs: OceanaGold Corporation has budgeted C$1.56 million to December 2018, which includes a 3,000 meter drill program that is currently underway at Curva. Nico: The Company has budgeted C$1.51 million to explore this high-grade Au+Ag project where exploration teams are currently advancing target definition, in parallel with permitting for Phase I drilling planned for the first quarter of 2019. JV partners Newcrest Mining, OceanaGold Corporation and Hochschild Mining have notified Mirasol they have budgeted a combined total in excess of C$7 million for drill programs and extensive surface exploration at Mirasol’s Joint Venture projects in Chile and Argentine this financial year (to June 30th, 2019). In Chile, this spend will be directed to testing compelling high sulfidation epithermal drill targets at the Altazor Au project and Intermediate Au+Ag targets adjacent mine infrastructure at the Indra project. In Argentina our JV partner OceanaGold Corporation has committed C$1.56 million (US$1.2 million) through to December 2018 for exploration for the Claudia project and a 3,000 m drill program currently underway at the Curva Au project. Over the same period, Mirasol will invest approximately C$4.5 million advancing exploration of the Company’s prospective Mio-Pliocene and Paleocene Au+Ag+Cu pipeline projects in Chile and the Nico high-grade Au+Ag project in Argentina. Mirasol is well advanced with a program of geophysics, geological mapping and detailed geochemical sampling at the Nico project’s Aurora and Vittoria prospects, in preparation for drill testing. In parallel, Mirasol is progressing drill permitting for the Nico project, where the company is targeting a January 2019 start-up for a phase I drill test of the Resolution, Aurora and Vittoria prospects. Mirasol strong commitment to business development is timely. There is a surge in interest in the Company’s Au+Ag+Cu project portfolio in Chile and in Argentina from companies interested in new JVs. Expressions of interest are broad based, coming from mid-tier to major producers, as well as private and publicly traded junior resource companies. The Company’s business development team is focused on completing new joint ventures that will secure further partner funding to advance exploration of the project portfolio. Notably, expressions of interest for potential new joint ventures for the Argentine projects are being received from in-country precious metal producers as well as from companies interested in making new or first-time investments in the country. Argentina is again experiencing high inflation and has implemented a new temporary export tax to increase government revenues. Neither event has had a measurable impact on Mirasol’s day-to-day operations as a project generator and exploration company in Argentina. The Company is continually monitoring the investment and operational environment in Argentina and will adjust its activities if conditions adversely change. Mirasol’s exposure to Argentina is balanced with its activities in Chile where the Company has three active joint ventures and a strong commitment to business development and early stage project exploration, designed to deliver new quality Au and Cu projects to the development pipeline. Mirasol remains in a strong financial position with approximately C$24 million in treasury as of Q1, financial year 2019 and anticipates receiving in excess of C$1.5 million in option payments and joint venture management fees this financial year, including the recently announced C$650,000 (US$500,000) option payment received from Newcrest Mining when it exercised its Farm-in option at the large Altazor Au project in Chile. Mirasol invites its shareholders to follow the progress of this season’s exploration via our website (mirasolresources.com). Mirasol is a premier project generation company that is focused on the discovery and development of profitable precious metal and copper deposits. Mirasol employs an integrated generative and on-ground exploration approach, combining leading-edge technologies and experienced exploration geoscientists to maximize the potential for discovery. 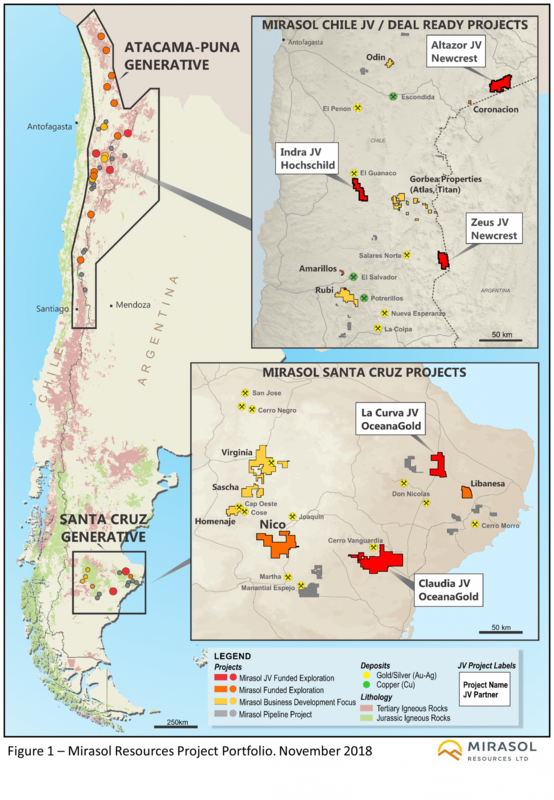 Mirasol is in a strong financial position and has a significant portfolio of exploration projects located within the Tertiary Age Mineral belts of Chile and the Jurassic age gold – silver district of Santa Cruz Province Argentina.